First available with the ASUS ROG DreamLeague Season #1 tournament, Fantasy Dota is an expansion on features originally included in the International 2013 Compendium. In Fantasy Dota, you join up to 5 of your friends to create a Fantasy League, where you’ll each design a Fantasy Team made up of Pro Players. You’ll then compete based on how well your players do in matches played in DreamLeague Season 1. 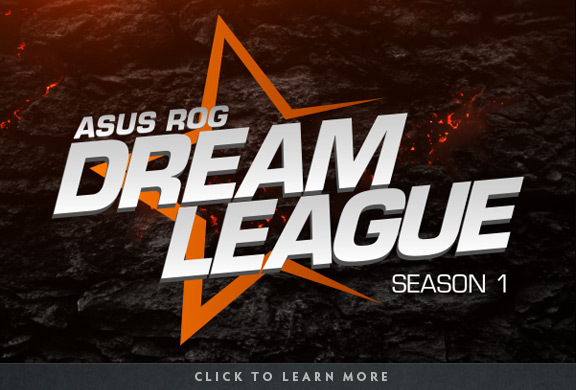 Buying the ticket for DreamLeague Season 1 makes you eligible to create a Fantasy League, as well as join any Fantasy Leagues that your friends create. Once you’ve bought your ticket and created a Fantasy League, you can invite friends to join you and set a time for the Live Draft. During the Live Draft, members of your Fantasy League draft Pro Players onto their Fantasy Team, however unlike the International 2013 Compendium, each player can only be owned by one person. After the draft is completed, the Fantasy League will automatically create round-robin weekly head-to-head matchups, where every week you’ll try to earn points to win against one of the other members of the Fantasy League. Fantasy Team matches will begin on March 3rd, so be sure to form your Fantasy League and complete your draft before then. Q. Can I create more than one Fantasy League? You can create one Fantasy League for each tournament ticket that you activate. However, after activating a ticket, you can join any number of Fantasy Leagues. Q. How many members can be in a Fantasy League? You can have up to six members in a Fantasy League. Each will have their own team. Q. What if I have an odd number of friends who want to play? That’s fine! One rotating team each week will get a Bye (basically a free win). Q. What if two Fantasy Teams have the same number of wins? Are they tied? Ties are broken by the total number of points scored in the season. Q. When does a matchup end? Weekly matchups end on Sunday night at midnight in the time zone of the tournament. At that point, wins and losses are assigned for that week, and the next week’s matchups begin. Q. Can a player be owned by more than one Fantasy Team? No, players are exclusively owned by a single team. Q. What does a player being “Core” or “Support” mean? Each player has been assigned a role, based on the role they generally play in pro matches. Players that play mid, off-lane, or carry are grouped under “Core”. Players that take more of a support role are classified as “Support”. Q. Does player role affect scoring? No, all players are scored based on the same criteria. Q. How are players scored? Q. How many players can I have on my team? You can have 8 players on your team. These 8 slots are divided into types. Q. What players can I put in each slot type? Core and Support players can only go into “Core” and “Support” slots. “Any” or “Bench” slots can contain players of any role. Note that a player in a Bench slot will not score points for their team. Q. How often can I adjust my roster? You can set your Active Roster for each individual day. Any day you don’t adjust your Active Roster, the settings in place on the previous day will automatically carry over. Q. When does a day’s roster lock? A day’s Active Roster becomes locked at midnight in the time zone where the tournament is located. So for a tournament taking place in Europe such as DreamLeague Season 1, the Active Rosters will lock at midnight CET. This lock time is displayed on the roster editing panel. Q. What does it mean when an roster is locked? When a roster is locked, you won’t be able to make any changes to it. This is to prevent roster changes happening while matches are being played. Q. How can I see how Pro Players have done in the past? The Player tab in the Fantasy section in the Community tab lists all players and their average stats over the last 100 league matches (all leagues) that they’ve played. Q. What happens if I miss my Fantasy League’s live draft? The draft system will automatically pick players for you. Q. Do players get more points if a best-of-three goes to a third game? No. In a best-of-three series, each player earns points only for their highest-scoring games. Q. Can I remove a player from my team? Yes, you can request to drop a player and pick up another that no other Fantasy Team owns (a “free agent”). These requests are all processed nightly. If multiple Fantasy Teams all attempt to pick up the same Pro Player, priority is given to the Fantasy Team with the worst record. Q. Can I drop and pick up more than one player at a time? No, currently you can only have one outstanding drop/add request. Q. Can I trade players with another Fantasy Team? Trading players between Fantasy Teams is not yet supported. Q. Do all matches played by a player in my roster count towards my score? Each Fantasy League is associated with a specific tournament, and only matches played as part of that tournament count towards player scores. Q. Do all Pro Players have the same scoring criteria? Yes, all Pro Players, regardless of role, are scored based on the same factors. Q. Do players in Bench slots earn points? No, players on your Bench do not earn points towards weekly or daily point totals. Q. Does it matter if players win or lose their matches? No, scoring is entirely based on the player’s performance in certain categories (kills, gold per minute, healing, etc). Whether they win or lose their match is not scored, though players that win matches will tend to have better individual performances. Q. When are scores updated? Scores are updated after every match completes. We’ll be expanding on Fantasy Dota as time goes on, and look forward to your feedback and suggestions!